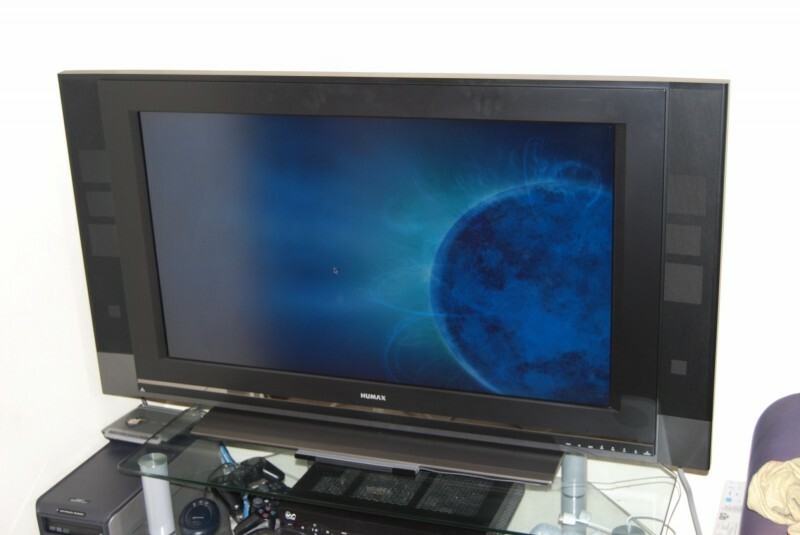 We’ve got a 40″ LCD TV made by Humax. We paid about £500 for it in early 2007, and up until recently I’ve been really very pleased with it. My mind has been changed because the remote control was becoming less and less responsive, and now it does nothing at all. I had dismissed issues such as flat batteries and dirty lenses on transmitters and receivers, and so turned to the internet for help. Here’s an interesting way of telling whether your remote control is broadcasting anything at all. 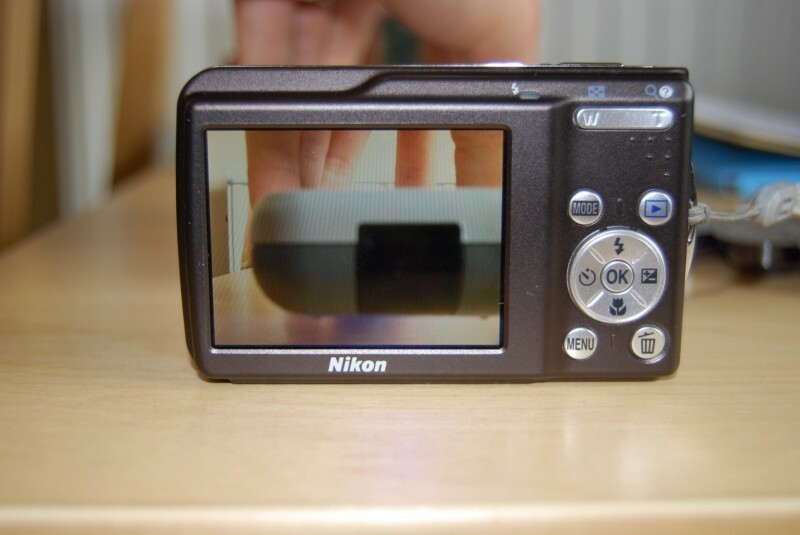 This is a photo taken with my SLR, of my point-and-shoot camera pointing at the end of the remote control. It’s faint, but you should be able to see a dim blue light in there. 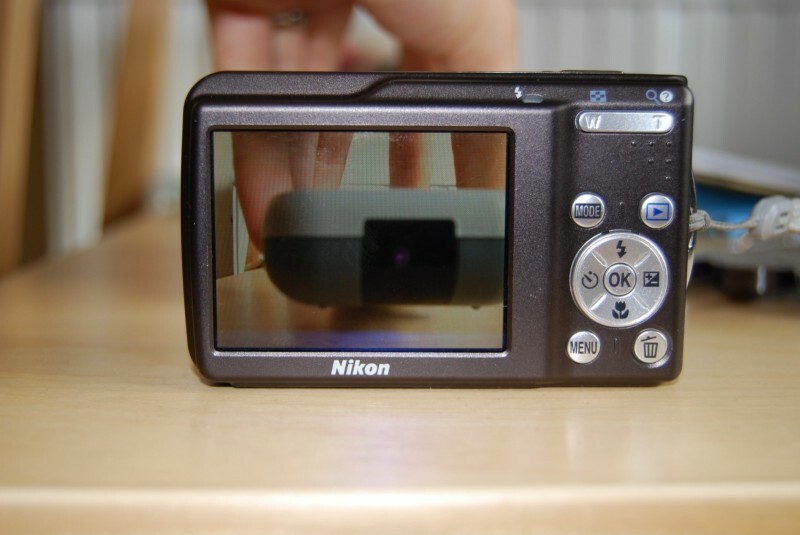 Due to this flickering it’s very hard to take a photo, but when looking at the point-and-shoot’s screen with the naked eye, the flicker is very bright indeed. Anyway, this proved that the remote was at least firing. It is possible that it is broken in some way, but I can’t check for that so I’m going to proceed on the basis that the remote is fine. So I turned my attention to the TV. 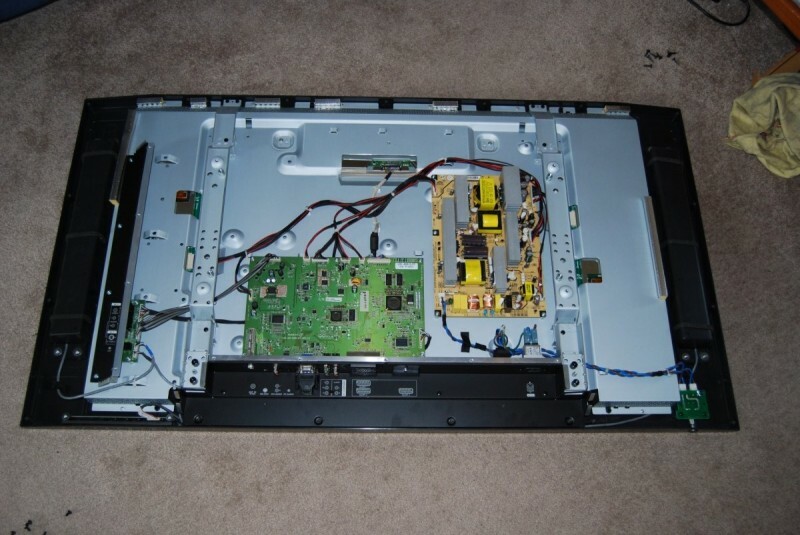 Getting the TV apart was quite easy. I was generally impressed by the engineering and the way in which it is screwed together. Eventually I got to the IR board. I fired up the TV and tried pointing the remote directly at the receiver in the hope that the TV case was dirty, but no luck. I took the multimeter to the pins on the IR receiver and found 5V, earth, and a third pin that wobbled around 3.5V regardless of remote control interaction – I guess I need an oscilloscope to get any further there. I re-flowed the solder on the IR receiver’s three pins to be sure there were no dry joints, but still no luck. 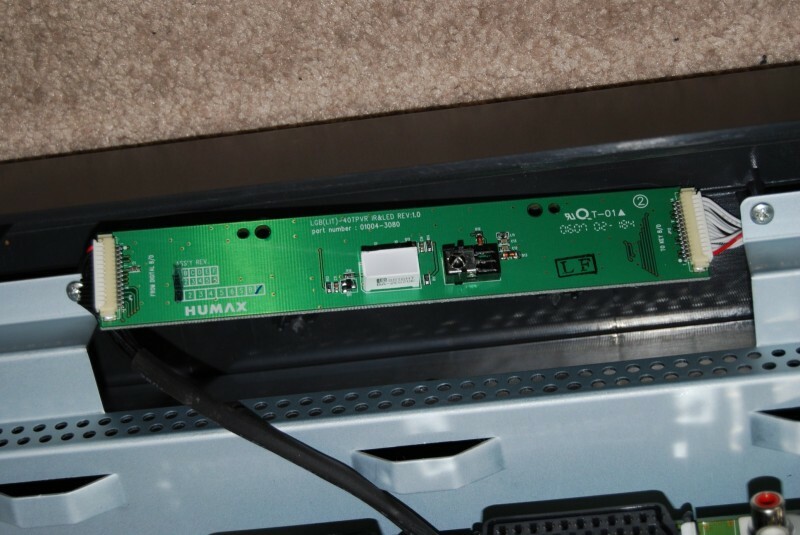 So at this point I’ve put the TV back together and have sent an email to Humax’s support department to see if I can source a replacement IR board. What’s interesting is that the TV’s buttons are connected to the left of that board, and the cable on the right leads into the TV proper. So as the TV’s buttons work (it’d be useless now without those!) I’d have thought the problem is localised to the IR receiver or the few components around it. Should be pence to fix really, but without more knowledge and assistance it looks like we will have to buy another TV. In this age of vast consumerism that seems quite a shame. Why not find out if anyone’s still selling that model, then go to the shop armed with your remote, and see if it works on their demo tellies! the av forums a great source of info & classifieds for av & computing. As it happens, I ordered a replacement IR receiver from RS this morning. It should arrive at some point next week, so I look forward to dismantling the thing again!